How can a foreign Non US. business obtain an EIN? An Employer Identification Number, otherwise known as an EIN, is a Federal Tax Identification Number that is used to identify a business entity. 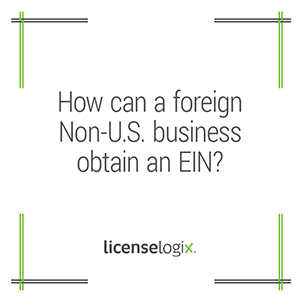 An EIN is one of the first steps a foreign business must take to start a business in the US. If a business operates, has employees, or files taxes in the United States, they need to obtain an EIN. Applications can be submitted online, by phone, by fax or by mail. Business Entities will also need a Primary Principal (Officer), who will either be an individual or an existing business that already has an EIN. Sole Proprietors will need a to provide their individual information. If the Sole Proprietor or Primary Principal does not have a SSN or an ITIN, the business cannot obtain an EIN online. In such a case, EIN applications will either need to be submitted by mail, which may take 4-5 weeks, by fax, which takes about a week, or it can be applied for and issued over the phone. If applying over the phone, you must also fax the application. LicenseLogix will help foreign businesses obtain an EIN and all other licenses and registrations, minimizing time-consuming and costly delays. For additional help you can fill in the form on the right or give us a call at (800) 292-0909.